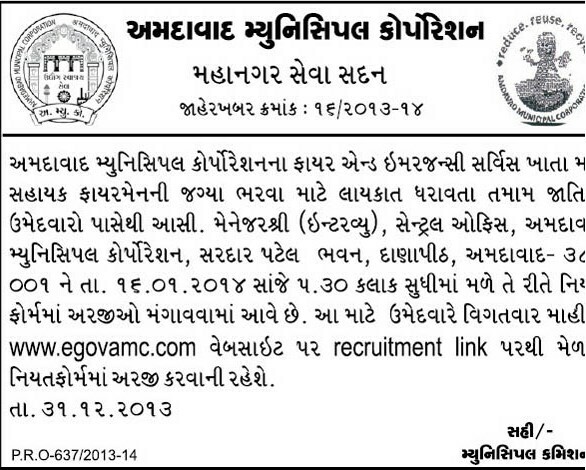 Amdavad Municipal Corporation Invite Application For For AMC Assistant Fireman Vacancies. Candidate Must Download Application Form On AMC Official Website www.egovamc.com and Fill All Details and Send By Post. How to Apply AMC Assistant Fireman Post: Candidate Download Application Fill All Details Connecting all Certificate and Send By post/rpad. AMC Assistant Fireman Recruitment More Detail About Qualification, Certificate and More Download Full Notification and Read Care Fully.